(This appeared in the Geelong Advertiser, on 5 December 2011, p. 20 as ‘Book it now, Winnie. Diversions, plagiarism and whodunnits’). It is time once again for the annual reading list which might assist some of you looking for something to delve into over the holidays or for a present for a friend or family member whom you know still enjoys the pleasure of a book they can handle and smell as well as read. If John Harms did nothing but produce the Football Almanac each year with Paul Daffey he would justify his status as a living national treasure, but he also writes some first class journalism. Geelong fans will turn quickly to the grand final replays led off by Cathy Sullivan, whose first published journalism was on the doings of the juniors and seniors of the Western Victoria Soccer Association in the Geelong Advertiser. Now she produces stories for Lateline on ABC, and she can evoke the spirit of Geelong families and their football team in a few deft words. John Harms also presides over a loose combination of amateur and professional contributors on sport to a website called the The Footy Almanac (www. footyalmanac.com.au). The quality is variable, the content sometimes very moving. The site is free of the kind of vituperative abuse which disfigures so many vox pop offerings on the net. Simon Townley’s Good to Great, the story of the Cats’ 12 year journey from near death to 3 premierships in five years and their plans to stay at the top arrived only this morning and so too late to be included in the Advertiser article. Full of pictures and great insight into the football revolution, on and off the field, it is something not just for the died in the woolly jumpers Catters but anyone interested in the transformation of an also-ran into a success. It is a story with resonance outside sport as well. Also hot off the press in the United Kingdom and launched in Geelong and Melbourne in December is Jennifer Kloester’s biography of Georgette Heyer. I have to declare an interest, because Jennifer has been a student and colleague for several years. Her companion to Heyer’s regency novels is already a best-seller and the biography will enhance her reputation as it reveals the most private of authors, whose popularity continues today and whose books are still in print. Jennifer also has turned her skills to writing a novel for young adults, which has been accepted for publication by Penguin. Steve Craddock put me on to James Robertson, And the land lay still. This is probably the Scottish novel of recent times and certainly a brilliant recreation of the mid and late 20th century. It takes several individuals and families and weaves them into a sympathetic but critical portrait of a country coming to terms with its altered place in the world. David Crystal, The story of English in 100 words, is also available as an e-book. It starts with ‘roe’ which he thinks may be the first English word written down and proceeds to recent importations into the language from the twittersphere. Crystal has several books on the language but this is probably the most accessible and something you can dip into or read consecutively as the words are arranged more or less chronologically as they came into use. Hazel Rowley’s Franklin and Eleanor: An Extraordinary Marriage has been justly praised in the United States and round the world. The complex relationships between the four-term American President and the woman who supported him throughout his political career and carved out a pioneering role for herself are sensitively explored. Hazel, who was a colleague for some time at Deakin University, died tragically young from cancer, but not before writing acclaimed biographies of Christina Stead and Richard Wright and a brilliant account of the partnership of Jean-Paul Sartre and Simone de Beauvoir. A fund has been established in her name to assist a writer with funding for travel and research so her influence will continue. A request to do a review took me to Ideologies in the Age of Extremes: Liberalism, Conservatism, Communism, Fascism 1914–91. It was an excellent idea of Willie Thompson’s to re-examine the dominant ideologies of that most ideological of ages, Eric Hobsbawm’s short twentieth century, from the outbreak of the First World War to the collapse of Soviet communism. A generation of students has grown up since then who live in a very different world where the forces which contend are very different both in content and in relation to each other. This is a worthwhile introduction to the period covered. 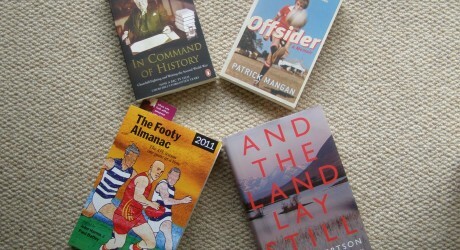 Patrick Mangan’s, Offsider is a Nick Hornbyesque account of growing up inspired by soccer in an Aussie Rules world. He and his brother John, both later excellent journalists, started their first soccer paper at primary school in rural Victoria. How could I not love a precocious pair of youths who had the presence and wit to adopt Ayr United as their team? Ayr was my home town team in Scotland and one for which my grandfather played and managed. Another book with a soccer theme is by Les Murray on The World Game. I got an early copy which contained a story about the relationship between Lucas Neil and the then Australian coach, Pim Verbeek, which led to a threat to sue the author. It was reissued without the offending material and the rest is Murray’s view of soccer and its star performers rather than a history of the code. The most impressive history I read this year is David Reynolds, In Command of History: Fighting and Writing the Second World War. This is a tour de force which compares Churchill’s six volumes of personal history of the war with what he did, said and wrote at the time before and after he became Prime Minister. Reynolds brings out the many ways in which the later account needs to be understood in terms of the political and other circumstances during which it was compiled. It is excellent critical history which does not diminish Churchill, but does not let him get away with many omissions and revisions of his stance on issues. Also it delineates very clearly the extent to which Churchill relied on his team of writers and researchers some of whose work appears in the books virtually verbatim but under the author’s name. A much longer book, covering a shorter period, and less innovative in its approach is James Holland’s The Battle of Britain. You will have read about 500 pages before you get to the main phases of the war in the air, which people correctly believe to be the nub of the affair. Holland’s account has several good stories of individuals, bringing out elements in the behavior and character of some of the leading figures which are often underplayed in previous accounts, but little new information on the overall course of events. My crime fiction includes the annual offerings of Ian Rankin, Val McDermid, Peter Robinson, and I have now worked my way through all of Stella Rimington’s Liz Carlyle novels and her autobiography as head of MI5. She is not in Le Carré’s league, but can produce page-turners, which become more illuminating once you have read her own story. Finally Eileen Shorrock gave me a couple of copies of the Staffordshire Sentinel for February and March 2000 which almost make a short book in themselves. They included the tributes and the stories about Sir Stanley Matthews who died that year. A superstar in his generation ‘The Wizard of the Dribble’ was the David Beckham of his era. He came to Australia with Blackpool in 1958 and returned several times thereafter to coach but not to play competitively. Jon Henderson is writing a new biography and would like anyone with stories about Matthews in Australia to get in touch. He can be contacted at jon5@talktalk.net.